Before it’s definitely old news, I did knit a few things for Christmas. I didn’t feel any obligation to knit for everyone on my list so there were no crazy deadlines to stress over. The projects were small, simple, and only took a few hours of dedicated work. I hope I remember this lesson for 2014’s holiday season. The first projects off my needles were a set of kitchen towels for a friend who recently bought a house. I used one ball of Knit Picks Dishie, US 6 needles, and two of my own patterns: the Laddered Cloths and the Bridges Kitchen Towel. The Cornered Slouch Hat, a pattern I released last December, was also a Christmas gift and I was incredibly tempted to keep it for myself. Big & Stripey here only counts as Christmas knitting because, A, it’s a stocking, and, B, I knit it during Christmas. My other travel project wasn’t working out and I wanted to just knit something. Decided I wanted to make a stocking with stripes and went from there. It was a simple thing to keep my hands busy during long car rides and low-key gatherings. I’ll block it eventually. Probably, right before it’s time to hang it up 11 months from now. The tiny one continues my tradition of knitting a new ornament every year. I couldn’t resist putting a palm tree down the leg since the Bearded One and I have been surrounded by the things since we moved. Now, no more talk from me about Christmas knitting until it’s time to start knitting for this year. The time will arrive sooner then it should. Always does. Just 15 days until Christmas, my dear knitting friends. I hope you're way ahead on all you're projects or at least close to being done. There's just one more thing on my very short knit list, a small ornament, and it should be finished by the weekend. I hope. If you're looking for a quick, last-minute gift, I recommend simple hats, mitts, washcloths, and sport weight socks. 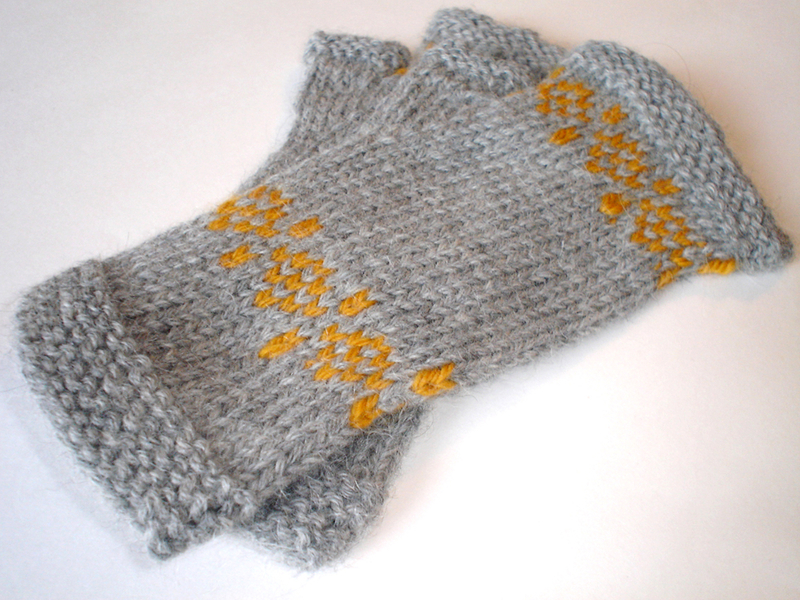 They're great tv knitting and you can wrap them up in no time at all. Sometimes, I just want to knit something simple. I want to knit, just to knit, without worrying about complicated details or evenly spacing decreases. 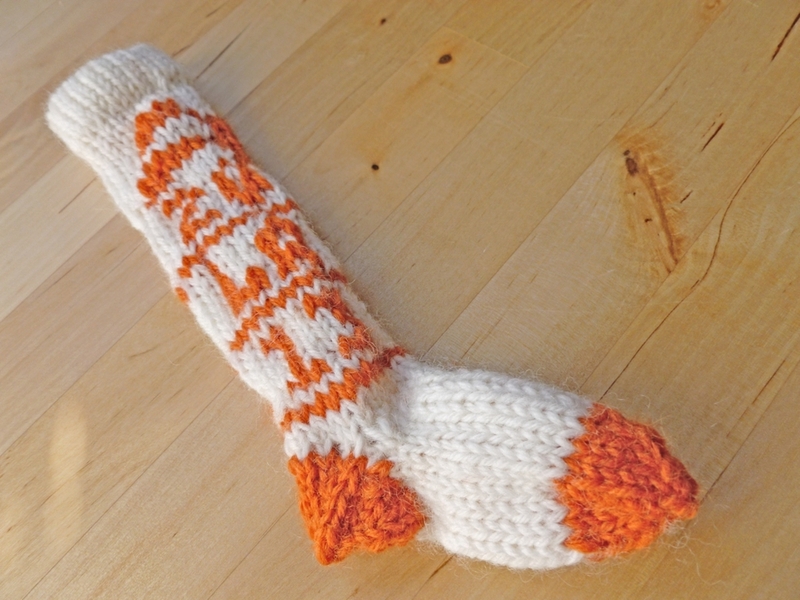 Times like these, I wander through my 18-page* Ravelry queue looking for something that catches my eye. The last time this happened was way back in May when the Unique Basketweave Washcloth grabbed my attention. I did the only thing I could do - grabbed a skein of colorful cotton and cast on. It only seemed right to keep going until I ran out of yarn. I vaguely recall knitting this washcloth while also watching a great anime that I can’t remember the name or the plot of. Mostly what I remember about making this cloth is how different my life was at the time. It was before I got married and before I picked up everything to move across the country. All that stuff was in the works though so this cloth was made with the intention of making a new place feel like home. The basketweave cloth is only the latest in a long standing tradition of knitting to warm a new place. I’ve done it for dorm rooms, new houses, and apartments for myself, family, and friends. What can I say, it works. Whether it’s a set of washcloths, a toy, or a blanket; a hand knitted item helps bring warmth and love into a house to make it a home. *Or more. At it’s longest, the queue was 24 pages long. I try to prune it more regularly now. One reason I love knitting is because of all the different things I can make. The other big reason is how easily it fits into the rest of my life. I don’t need to sit at home to knit. I can go out with my knitting and not be stuck in front of a computer. I can run errands with yarn and needles in my bag to keep busy and not waste time standing in line. For the last few years, my favorite bit of purse knitting has been socks but I’ve also hauled along hats, fingerless mitts, and even a shawl or two. 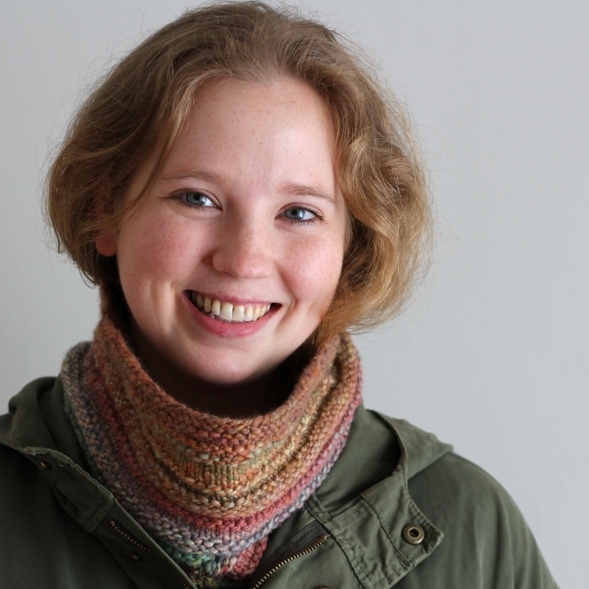 I carried around the Hitchhiker Shawl until I had to wrap it around my arms so it wouldn’t trail along behind me. Before I learned to make socks and developed a love for shawls, I carried along washcloths to keep my hands busy. I clearly remember knitting a washcloth in a doctor’s waiting room. While the lady sitting across from me thought my knitting was pretty great, I was just a little embarrassed. Not because I was seen knitting in public by stranger but because I was embarrassed to be seen knitting a washcloth. At the time, hand knitted washcloths were all the rage. However, for as many people I saw extolling the virtues and wonders of knitting your own washcloths, there were just as many people typing their distaste. 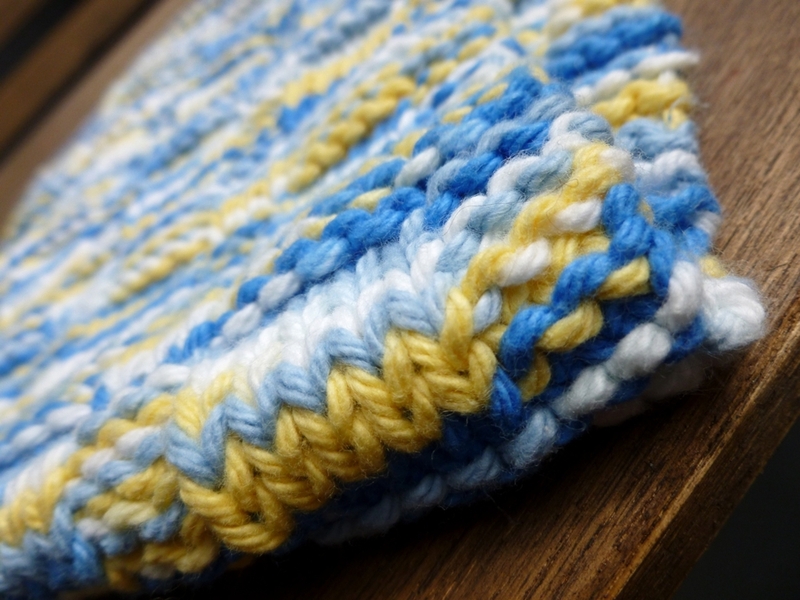 One person wrote they would rather pull out their own hair rather than knit a washcloth. Another commenter stated that they would flat out refuse knitted washcloths given to them as gifts. It was comments and thoughts like this that were swirling around in my head as I was sitting in the doctor’s waiting room stitching away. You either had to love knitting washcloths or hate them. There was no in between. I was afraid that some knitter - one that unapologetically hated knitted washcloths - would see me and sneer. So I slunk down in my chair, kept knitting, and hoped that the imagined sneering knitter would not appear. The thought that some knitter who loved making washcloths might appear did not occur to me. I couldn’t help feeling that way even though I knew it was silly and completely illogical. Several years later, I’m certain that it’s silly and illogical. Just because someone on the internet or in real life says they don’t like knitting washcloths or lacy socks or giant blankets or funny hats doesn’t mean you have to feel like a smuck for enjoying those things. If you want to knit a stack of washcloths 10’ high or a hat that looks like a cooked turkey, go for it. Enjoy it. Have fun. Own it. Just knit what you like. Knit what makes you happy. You don’t have to sneak away and rent a hotel room to get your fix for knitting washcloths or full-length beaded opera gloves. Over the years, I’ve since come to terms with my love of knitted washcloths. They’re small, colorful, generally easy, and entirely functional. I like them for scrubbing my dishes and scrubbing my back. If you’re wondering, I do have separate kitchen cloths and bath cloths. Don’t worry. My kitchen has a special drawer filled just with knitted kitchen towels and a few crocheted clothes from a friend. I have an unapologetic stash of kitchen cotton. What’s more, I’ve released six washcloth/kitchen towel patterns and have a few more in mind. The Triforce Washcloth and Bridges Kitchen Towel are the most popular but my favorite is Cthulu Rising. I have no intention of not knitting washcloths because they’re awesome and I enjoy it. Socks are my default purse knitting of choice now but I’m not afraid of sneers or derision, real or imagined, for knitting washcloths or anything else. I say, knit what you love and be proud of it. I love the versatility of knitting. I can have giant projects that take months to finish like the Norma Blanket. I can have medium sized projects like the Shur’tugal Socks which fit in my purse and keep me entertained for weeks. I can also have small projects as a refresher and break from the larger projects. It’s a good thing there’s no such thing as the knitting police or they’d be writing me up for just how much I have on the needles. The current small project of choice is the Unique Basketweave Washcloth by Anna Peck Maliszewski. 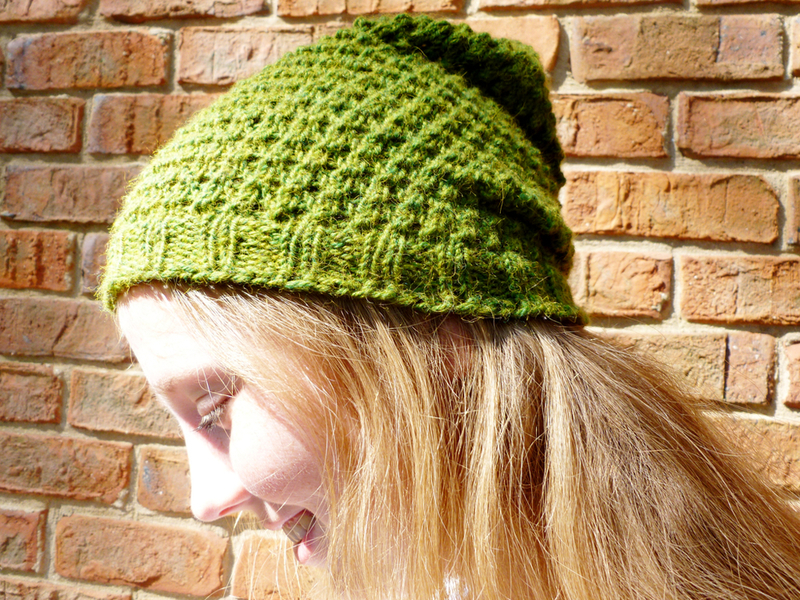 It’s a simple pattern that’s easy to remember and looks great in variegated yarn. I can knit a few rows here and there without loosing my place which is great since I only have a few minutes for knitting these days. Plus, knitting a few stitches helps me focus and not run around like a headless chicken. Yep, knitting is good. I'm not sure why I keep making kitchen towels or washcloths for that matter. It's not like I don't have more than enough already. However, I do have a lot of cotton yarn and I could be making other things - like market bags - but washcloths and kitchen towels rule the day. Oh yeah, I also really like making them, whether it's just a random pattern or a Nintendo character. I also like giving them away too. Washcloths will randomly arrive at my friend's houses any time of year without the need for an occassion. Following that vein, I'm giving the pattern away too. 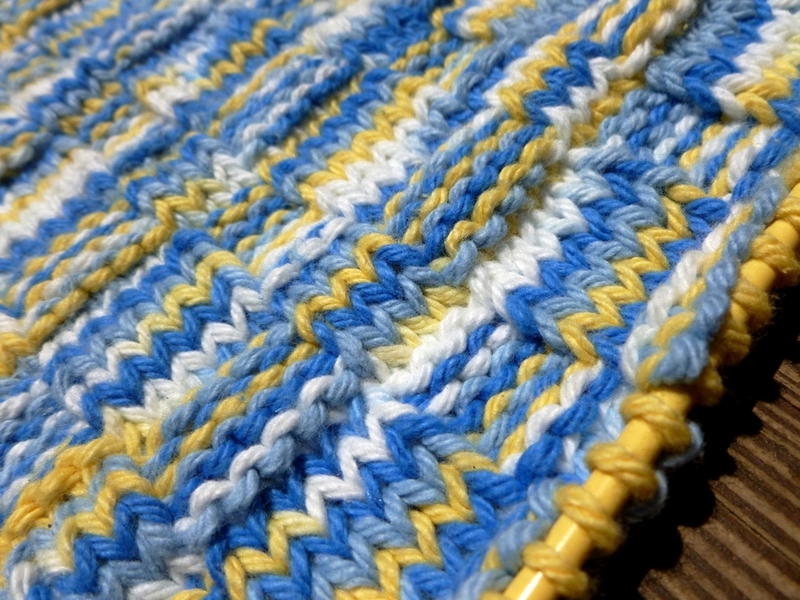 It's a combination of stockinette and a quasi rib that reminds me of bridges crossing a river. Plus, it only uses about 95 yds of worsted weight yarn. Make one and give it away or give it to yourself. Both options work quite well. Usually, I have a tried and true way of doing things. Socks are always knit from the toe up. Sweet tea always has lemon. Pencils always get put away point down. All that uniformity gets a bit boring sometimes so I like to mix it up on occassion. 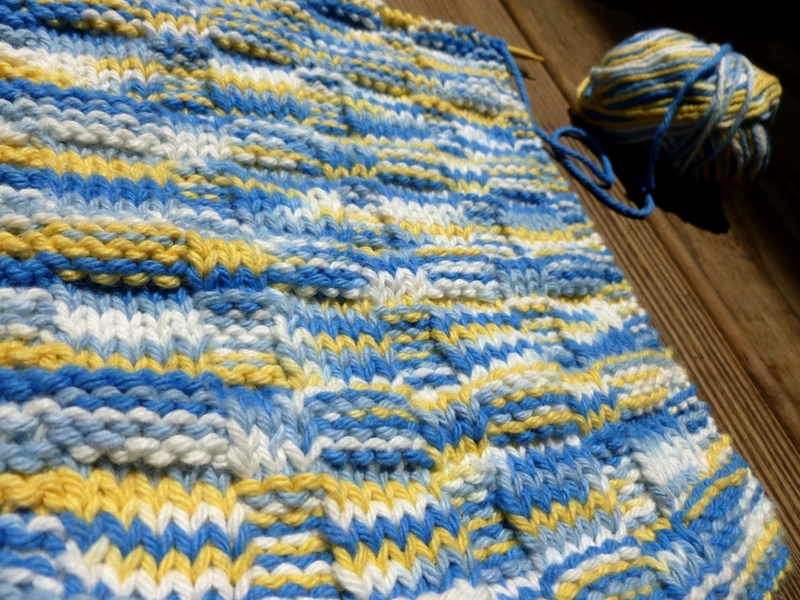 This latest time just happened to involve kitchen towels which I can't help but knit every couple of months. I've lost track of many I've made over the years and all the same way: bottom to top. It finally got just a bit boring. So, instead of bottom to top, I decided to make one from side to side. 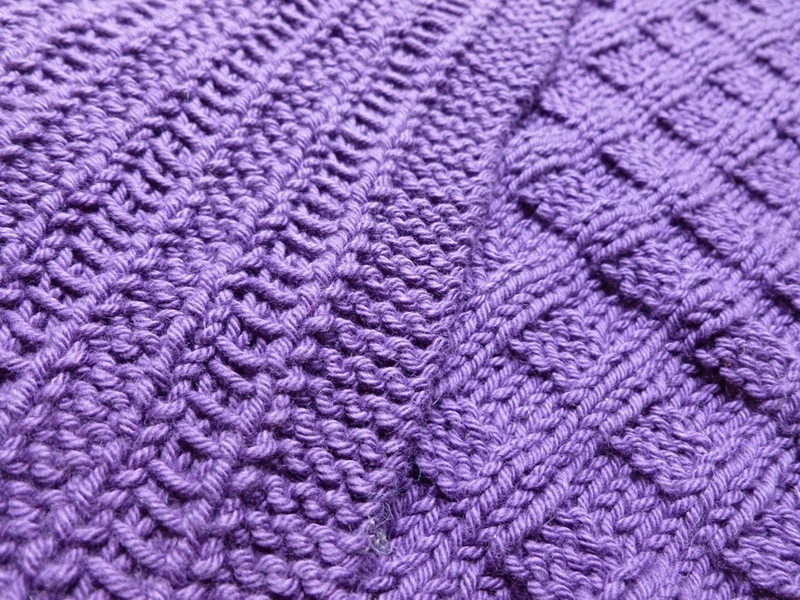 It worked out pretty well too with worsted weight cotton, US 7 needles, and a simple stitch pattern. After that little diversion, I'm ready to go back to my usual ways but I'm definitely going to try different things more often. There’s always a bit of work involved to make a place feel like home. Moving boxes and setting up furniture is only the start. For me, though, it’s the small things that have the biggest impact. So, when house hunting began in earnest, I dug out my cotton stash to make a piece of home. Three kitchen towels were finished soon after moving day and, after a few months of use, they look like they belong here. It finally feels like I do too.